Tumbleweed Southwest Grill is a leading American based chain restaurant business. Tumbleweed Southwest Grill was founded by George and Linda Keller in 1975 with the first restaurant located in a small building in New Albany, Indiana. The restaurant started by serving original American fusion food and this became an instant hit with many people travelling from far just to be served their dishes. In 1995, the restaurant had grown to 7 stores and among the menu addition was wood-fired grilling. By then, it had already started planning expansion beyond the local area and this saw the start of franchises with the most notable one headed by Matt Higgins. 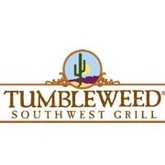 Tumbleweed Southwest Grill operates as a Subsidiary of the CFS(Custom Foods Solutions). There are currently 0 consumer reviews about Tumbleweed Southwest Grill available. Share your review. Please take a note that you are about to post a public review about Tumbleweed Southwest Grill corporate office on CorporateOffice.com. This review will be public, so please do not post any of your personal information on this website. If you would like to contact the corporate offices of Tumbleweed Southwest Grill, please use their contact information such as their phone number, website, and address listed above to contact them. However, sometimes staff from Tumbleweed Southwest Grill headquarters do read the reviews on this website.